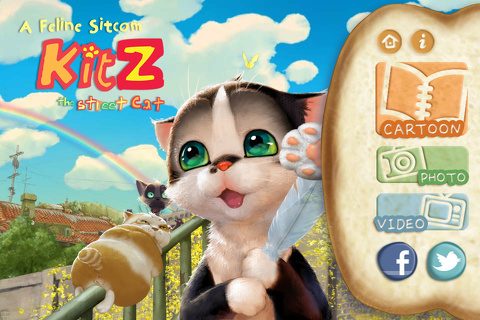 Kitz, the Street Cat is a unique iPhone, iPod Touch, and iPad app that blends elements of magazine comics, animated GIFs, and gesture controls to create cute, interesting, and fun stories to engage cat lovers and kids. The developers at Floating Island refer to Kitz, the Street Cat as a “feline sitcom,” but it is much more comparable to an ebook finessed with popular technological tools. The home screen and navigation tools are witty, intuitive, and highly effective. The wickedly cute cats fill the screen, and the fun, bouncy soundtrack greets you. On the right side of the screen is a cat’s paw. You touch the cat’s paw to make the navigation menu slide on to the screen. You can select from cartoons, photos, and videos, as well as share activity on Facebook and Twitter. The photos and videos section has captured adorable, LOL cats, so you can save them to your iPhone, iPod Touch, and iPad app. The promotional YouTube video is also available, and it’s fun. The list of videos includes an introduction video and seven chapters available. You select a video to download with a touch. The download time seems a bit slow, so you will definitely want to make sure you are on a solid wi-fi connection to access the best content of the Kitz, the Street Cat iPhone app. When the video starts, you use gesture controls to swipe vertically down the screen. Gradually, the story and cute content is revealed. The story of Kitz, the Street Cat is illustrated by a series of animated GIF-style videos in magazine-style comic boxes. The boxes may be side by side, overlapping, stacked vertically, or in any way that makes sense with the story. Visually, this is an interesting and fun treatment. Lights twinkle, Kitz moves, and the background shifts. Text and a complementary soundtrack further enhance the experience. These animated comics are great resources for parents. With a bit of forward thinking, you can download them to keep kids entertained while traveling or suffering through a sibling’s activity. Five cartoons are available for free, and the next three cartoons can be purchased within the app for $.99. This is an extremely reasonable investment, but parents with iPads would prefer an optimized version. These stories would be visually attractive and exciting on a larger screen. Kitz, the Street Cat is a modern, fun version of the universally great story of finding strength and belief in yourself to make life better. AppSafari review of Kitz, the Street Cat was written by Jenni Ward on December 5th, 2012 and categorized under App Store, Books, Free, Fun, Kids, Photos, Video. Page viewed 5112 times, 1 so far today. Need help on using these apps? Please read the Help Page.